YouTube has become enough of a living-room mainstay that 150 million hours of its content are viewed every day on TVs. Seven in ten YouTube subscribers say they now watch on TV screens thanks to connected devices and gaming consoles. The platform, created in 2005 by former PayPal staffers and bought by Google a year and a half later for a tidy $1.65 billion, currently has 1.8 billion monthly logged in users in 90 countries according to CEO Susan Wojcicki. Two recent milestones include 41 million total viewers of Coachella 2018 and, also within the past year, a record-setting 5 billion total views for “Despacito” by Luis Fonsi, featuring Daddy Yankee. In May, Morgan Stanley pegged YouTube’s worth at $160 billion, more than one-fourth of the value of Google’s parent company, Alphabet, as a whole. 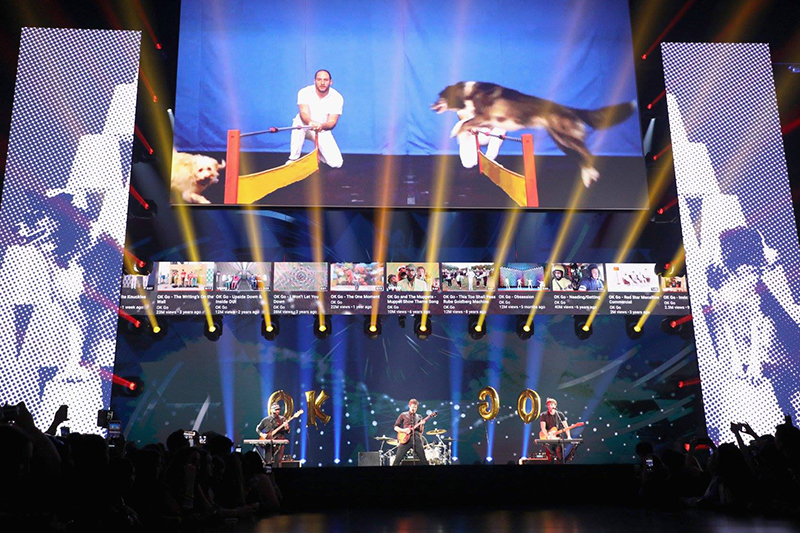 In their efforts to attract more advertisers that traditionally run on television, YouTube and other digital networks came together and created what is known as the New Fronts, seven years ago. The phrase takes off from “Upfronts”, which is associated with TV network advertising. Advertisers making their TV buys for the year gather annually at this network sponsored event. 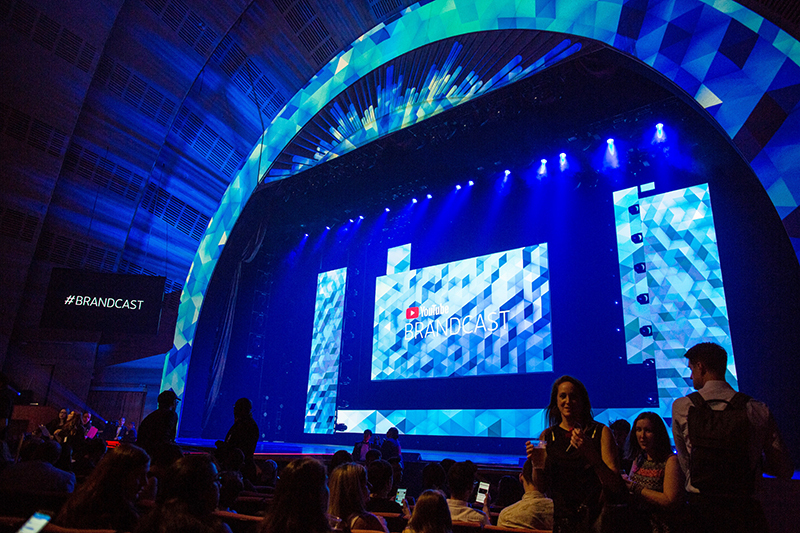 For the seventh annual Brandcast event at the New Fronts, YouTube stepped up its message and filled a bigger venue, 6,000-seat Radio City Music Hall. Jared Siegel, co-owner and director of production at Good Sense & Company, and senior producer Tim Mather have been producing YouTube’s New Front since its inception in 2012. This is the first year the event was staged in Radio City Music Hall. Google, YouTube’s parent company, books the talent, while Good Sense handles design, show flow, logistics and execution. They hired Abigail Rosen Holmes of NYXdesign LLC, who has lit the event for the last four years. “One of the highlights of the YouTube events are the really incredible video content, made by LA Made Creative and Obscura Digital,” says Holmes. 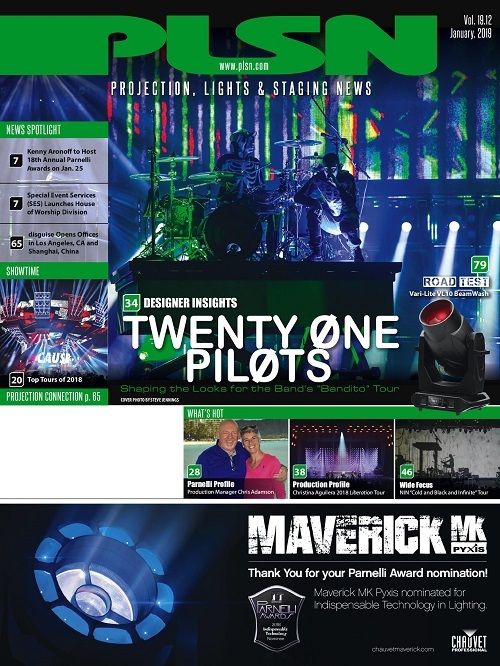 “That media serves as a fantastic roadmap for the visual effect in the lighting. 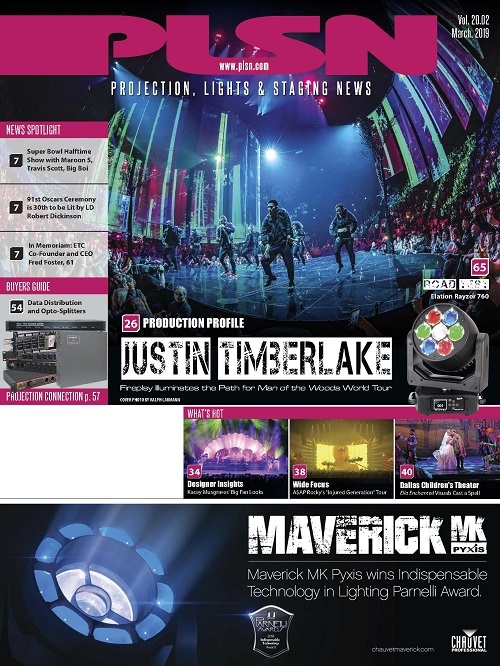 Weight and size were primary considerations for fixtures mounted to the moving scenery, “but these still needed to be a full function fixture,” so Holmes used the Claypaky Mythos 2. The look and feel of some of the performance segments led to the choice of some other fixtures such as the GLP X4 Bar 20 and Robe MegaPointe. Ariana Grande in Radio City Music Hall during the event. Grimes, a freelance ME and gaffer, has worked many projects with designer Holmes for “about 15 years now,” he says. 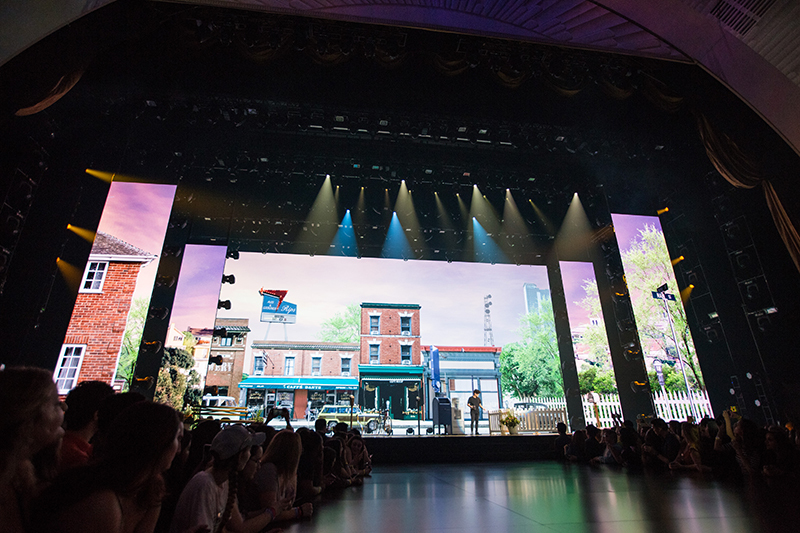 His scope of responsibilities for Brandcast as part of Holmes’ team included figuring out signal path and interfacing her design elements brought in by 4Wall with the house system, which was, he says, “quite easy, actually. Radio City has excellent infrastructure and all their paperwork is kept up to date. Projection also determined where any audience lighting package could be positioned. 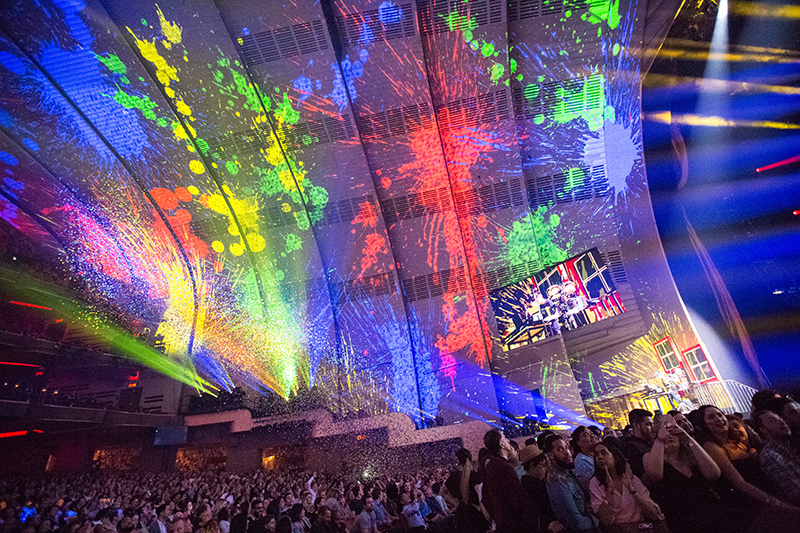 Grimes is referring to the permanent ceiling projection system Radio City Music Hall installed for their Christmas Spectacular in 2017. In house projectors illuminate the ceiling coves. 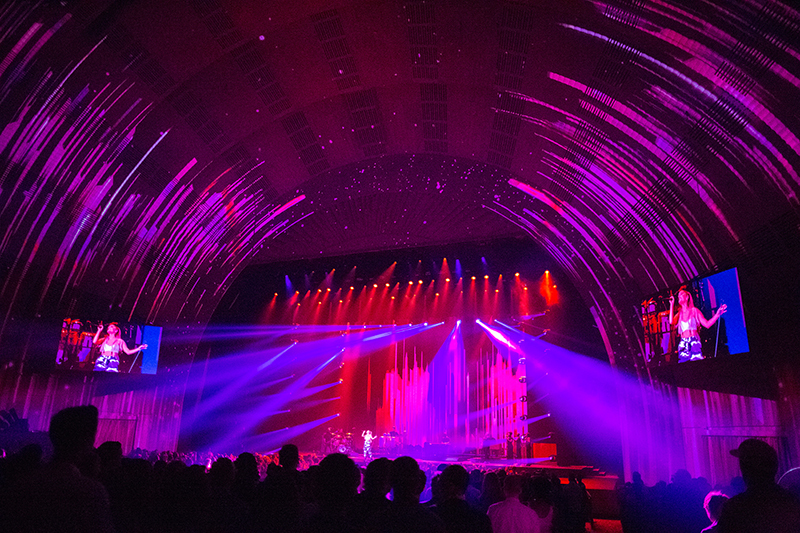 To provide an immersive feel, the combination of LED and front projection screens used on stage was extended to all eight of Radio City Music Hall’s arches via an expanded 36-channel bank of double-stacked Christie Boxer 4K30 digital projectors. 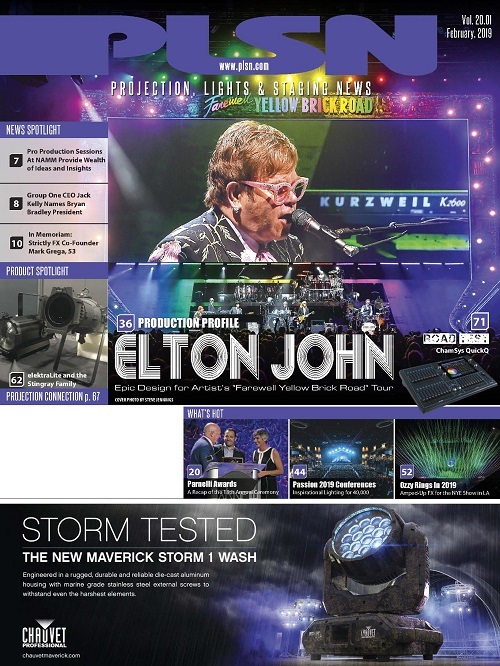 An expanded 36-channel bank of double-stacked Christie Boxer 4K30 projectors received the server feeds for projection mapping, and four channels reached a new 8K x 4K LED wall with ROE tiles and VER Revolution M8 processors, spanning an area measuring 94 by 43 feet, which served as a critical digital backdrop for the production. The in house I-Mag screens are LED, comprised of 3.47mm VER Advantage and ROE Black Onyx displays. Located on either side of the proscenium, they measure 18.5 feet by 9 feet, 10 inches. Upstage lives an in-house LED screen made from 3.47mm pixel pitch black 3SMD VER Advantage and ROE Black Onyx LED tiles. The production also made use of 34 7th Sense Infinity media servers, which output two channels each of single mode fiber 12G-SDI at 4096 x 2160 60fps 10-bit 4:2:2 resolution, into an Evertz EQX 12G fiber router and EMX multi-viewer system, offering A-B source redundancy with clean switching and monitoring before heading out to facility fiber distribution. Madison Square Garden Entertainment, which owns the iconic venue, acquired Obscura Digital, one of the two content creators for the Brandcast. Obscura Digital provide all the projected content for the arches in the room, working in tandem with LA Made Creative, the event’s other video content provider. Josh Perlman, director of video services at WorldStage, has been Good Sense’s go-to project manager for more than 10 years. He oversaw all the video elements on the show along with his team of 20 project managers, engineers, LED and projection techs, content wranglers, media server programmers, and camera people. A brand new switching platform from Christie, the Spyder X-80, was the primary switcher. A disguise media server was utilized for playback. This was tied in through the house network to trigger the in house 7th Sense servers. “We sent those a cue from d3 to trigger everything,” says Perlman. 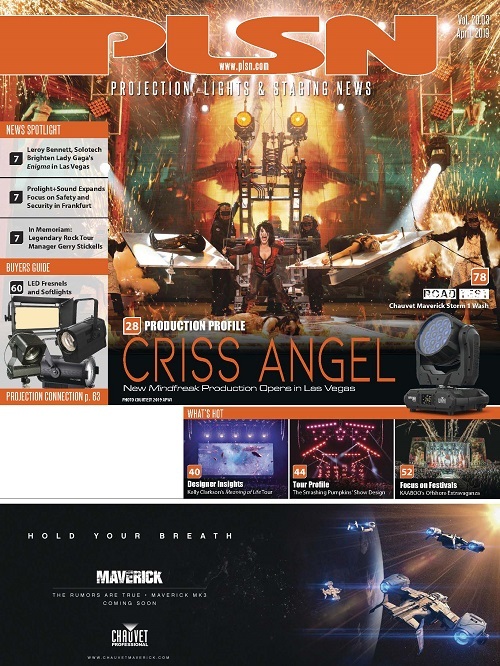 To cover a vertical strip over the proscenium, WorldStage provided six Christie 30,000 lumen 4K Boxers. 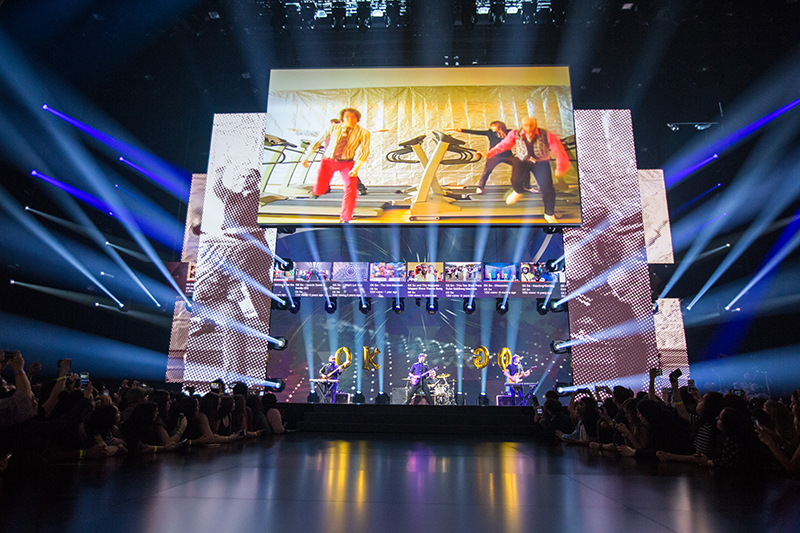 A confidence monitor, which was positioned 90 feet from the stage at F.O.H., was comprised of WorldStage’s own 3.1mm c3ONE LED tiles, forming an 8-by-5-foot (WxH) display. The production’s Hero screen was a front projection surface measuring about 30 by 17 feet (WxH). WorldStage provided the “cutter” screen that moved up and down while spanning the stage at 70 by 4 feet (WxH), and also the two pairs of vertical screens measuring between 7 and 8 feet across and 25 to 30 feet in height, all made from ROE CB5 5.7mm tiles. Senior producer Tim Mather cites the experienced crew members as a key asset. 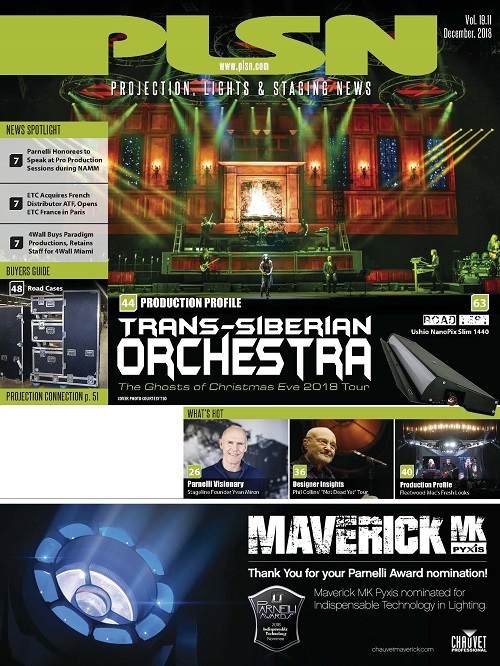 “We’re fortunate we have been doing these seven years and brought back a lot of the same team,” he says, noting that “sound and video have been consistent, with One Dream Sound providing audio to complement the house system, comprised of Meyer Sound Lyon components. Local 1 vets Mitch “Bubbles” Keller and Neal Pushkin led the audio team, and Glenn Angelino led the rigging team. 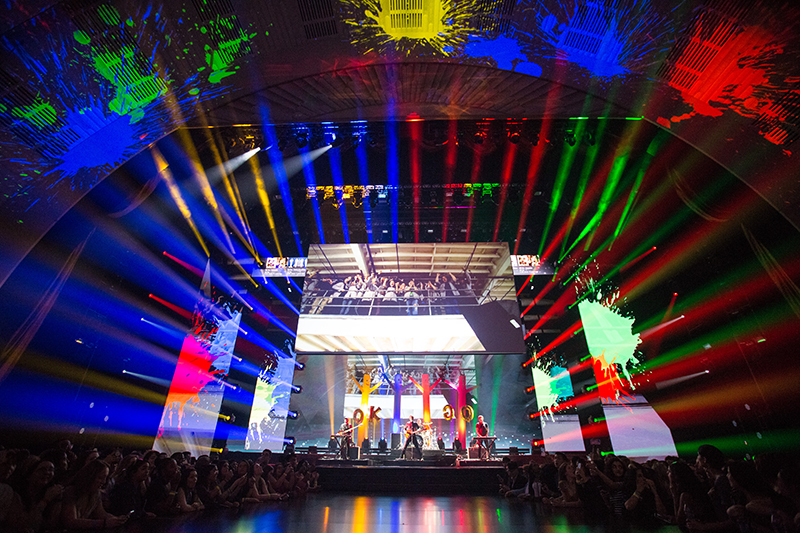 This year’s design involved the use not only of all the lifts in Radio City, but also of large moving LED and projection pieces, many of which also served as lighting positions. The show has grown to over 4,500 guests for the main event. “Finding a venue that can support over 3,000 people is a tall order in New York City,” says Siegel.